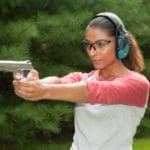 Everyone’s aware of the obvious dangers of owning and operating a firearm. If you don’t take care of it, or follow certain safety procedures, you could seriously hurt yourself or somebody else. But what about the non-obvious dangers? One in particular, hearing loss, affects thousands upon thousands of hunters and gun enthusiasts in America alone. And some don’t even know that they’ve been affected — though their loved ones are probably aware, with all the “Huhs?” and “Whos?” and “What’s?” likely being thrown around. The Best Electronic Hearing Protection: Our Top 3 Picks! The Impact Sport, produced by Howard Leight, a global provider of electronic and passive ear protection devices, boasts a slim frame — especially for an electronic device — and comes equipped with loads of awesome goodies. There’s a single, easy-to-use power and volume control, a 4-hour shut-off timer and an AUX jack that allows for connection to MP3 players and other devices. The earmuffs automatically block loud, impulse noises, bringing them down to a tolerable level, all while amplifying safer sounds, like conversation and ambient noise, up to 4 times their normal range. They’re foldable frame makes for simple storage and they’re pretty accurately priced for everything they offer. The Impact Sport definitely are amongst the best ear muffs for shooting. Though not as sleek as The Impact Sport, Champion’s Electronic Ear Muffs still provide respectable noise reduction while offering the same kind of amplification abilities. They’re also fully adjustable and easily collapsible for increased comfort and convenience. Priced at around half of what the previous pair are selling for they’re pretty inexpensive, especially since they provide better protection. (See NR Rating below.) Each earmuff also contains a separate volume control, so you can reduce the noise from your shooting side, while keeping your other ear amplified. Should we call them the best shooting ear muffs? Within that price range, we think they’re one of the top. Developed by 3M, a multi-billion dollar corporation that specializes in innovative consumer products, The Peltor Soundtrap Tactical provides some of the best electronic hearing protection for noises over 82dB. Independent volume controls on each of its stereo-microphoned cups allow for complete control and increased amplitude, while its lightweight frame and fold-ability allow for easy storage and free range-of-motion. Minimizing firearm interference, The Peltor Soundtrap is as sleek as The Impact Sport, though they’re a bit more expensive. The fact that they’re available in both headband and neckband styles does lend itself to some added versatility however. The Best Passive Ear Muffs: Our Top 3 Picks! Again, developed by 3M, the Peltor Bull’s Eye Earmuff is a price-friendly, non-electronic earmuff that boasts a sleek build and a lightweight design. The headband is fully adjustable and padded for your comfort and the ear cushions are incredibly soft. Depending on the size of your head — if yours is rather large, then this might not apply — but the Peltor Bull’s Eye has a Goldilocks-style fit, as it’s not too loose, nor too tight, preventing headaches and lost equipment. And, priced at just under $15 in most stores, the earmuffs are wallet friendly as well. Not a bad buy if you’re looking for something simple yet effective. Silly name aside, the Leightning L0F, designed by Howard Leight, might be the slightest and slimmest of all the earmuffs in this article, which is awesome if you’re working with some close-firing firearms. Its ultra-slim frame can also fold down to a quarter of its size, making it super easy to carry. Design wise, they most definitely lead the race for the best ear muffs for shooting. 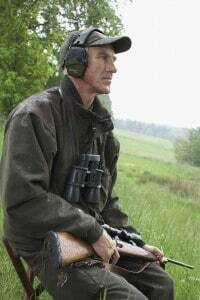 Add a pair of super soft ear cushions and a padded headband and you have yourself one of the most comfortable shooting accessories on the market. And, thanks to its steel wire construction, said comfort doesn’t come in exchange for craftsmanship. At just over $20 (typically, as price varies depending on the store), it’s a pretty good purchase as well, especially since it weighs all of 6 ounces. Utilizing a combination of advanced technologies, including newly designed spacers, specially formulated earcup liners, dielectrics and a twin headband that helps reduce heat buildup, The Peltor X5A is, without a doubt, the most advanced set of passive ear muffs for shooting on this list. A wire headband and tilt-able earcups also make it one of the most wearable as well. Do you like bells, whistles and added accessories? Or do you prefer a plain pair of functional earmuffs whose sole priority is to protect your hearing? All hearing protection devices must first be inspected by the U.S. Environmental Protection Agency before sale. During this inspection, the item is given an NRR, a noise reduction rating. The number, however, is only an approximation. To better understand how effective the device truly is, it’s best to reduce its NR rating by 50% and then subtract that number from the decibel level you you’ll be working with. 124.5dB = A much safer sound range for your ears. Or, if you don’t like math, just remember, higher ratings mean less noise. It’s as simple as that. Earmuffs can be a little heavy on the head, depending on their design. It’s best to find a set that will sit securely on your noggin without giving you a headache and without making you feel too top heavy. Proper padding and insulation are important as well. Finally, it’s also important to think about what you’ll be using the earmuffs for. If you’re planning on being out in the woods, or on the move, you might want to go with a slimmer pair, for ease of mobility. Where will I be wearing them? Is it okay if they’re neon green? Is it okay if they’re not-so-easy to carry? These are some of the color and design questions you should be asking yourself while shopping for the best earmuffs. Bright orange, non-foldable earmuffs might be fine if you’re trying to shoot in style at the range, but if you’re out hunting, it might be a different story. Just something to keep in mind. Can you really put a price on eardrums? We don’t think so, especially since most earmuffs, electronic or not, come equipped with some pretty worthy additions, and at such affordable prices to boot.